So now we know the predictable results: out of 32 million registered voters, a paltry 23% turned out, itself a considerably inflated figure. Hosni Mubarak received 88.571% of the vote, Ayman Nour 7.3%, and No’man Gom’a a pathetic 2.8%. The only surprise is that Nour came in second place with quite a respectable showing. The fascinating thing about the presidential selection spectacle is certainly not that it constitutes a “huge step” on some hypothetical road to democracy, or that it “opens the door” to democracy, or that it’s a “historic turning point,” or any of the other unbelievably pat metaphors mechanically repeated ad nauseam these days. To me, the really noteworthy fact is how an evident farce was turned into a real process by those who refused to be sidelined and deceived. Consider: On February 26, Mubarak made his “historic announcement” to permit direct presidential elections, which he surely thought was a brilliant manoeuvre to extend his tenure in democratic garb. Six months later, there’s utterly unprecedented societal mobilisation against rigged elections, judges and courts have joined the battle on the side of citizens, the regime’s cronies and their fake institutions are severely discredited and embattled, and on election day activists marched through downtown streets filling the air with cries of “Batil! Batil!” (Void! Void!). Seems like even the best-laid plans are bound to unravel. Pity. A week before the election on September 7, everything was going swimmingly for the Mubarak regime. All the requisite ingredients were in place. A very correct Presidential Elections Commission (PEC) headed by the Supreme Constitutional Court chief was conjured up to lend an air of gravitas. The president’s handlers arranged for the best makeover money can buy, featuring a new and improved Mubarak with a studied populist touch, though no one missed the visible fatigue of the star “candidate.” Suzanne Mubarak was trotted out to recall her girlish crush on her future husband, sharing with the nation her feelings of immediate attraction to the handsome young man in uniform (shudder). No’man Gom’a was prevailed upon to lend his services, with promises of handsome rewards. And clueless American senators blessed the whole process as historic bla bla bla, and bla. Foreign-trained Egyptian image-makers were flown in to choreograph the president’s make-believe campaign. It was deemed fitting to surround Mubarak with model citizens outfitted in model garb. There was the token muhaggaba, the token peasant in gallabiyya, the token clean-cut professional in sharp suit, a veritable panorama of the nation’s sartorial diversity. All were instructed to paint solicitous expressions on their faces and muster those plastic smiles. Mubarak was also positioned in down-home settings flanked by idyllic vistas, bantering with ordinary Egyptians and partaking of their afternoon tea. No surprise that we all saw this for what it was: a fake exercise dripping with the Mubaraks’ notorious contempt and disregard for hardworking, ordinary Egyptians. Aside from the inconvenient little fact that nobody bought it, the Mubaraks’ plan seemed impeccable: the president would “win” by a respectable margin, go through the pomp of swearing the oath before parliament, and then deliver an address calling on the nation to come together in magical consensus to confront the challenges ahead and continue Egypt’s march to democracy. Voilà! Mubarak’s ugly autocracy would be outfitted in the beautiful new robes of democracy, carping domestic critics would fall silent, restive foreign patrons would be satisfied, and the Gamal Mubarak project would be handled by stealthier means. What could possibly go wrong? Some Egyptians taking it all seriously, that’s what. As with so many moments in Egyptian history, a silly farce suddenly turned serious, completely overturning all expectations and radically altering the calculations and strategies of all relevant parties. I refer to seemingly quixotic gestures such as suing the PEC suddenly leading to momentous consequences; relentless judges refusing to abdicate their hard won power of certifying the people’s representatives; ordinary citizens taking it upon themselves to act as election monitors; election extras such as Ayman Nour shrewdly capitalising on regional grievances to extend his name recognition outside of Cairo, particularly in Port Said and Sinai; and demonstrators roaming downtown streets on election day, vilifying Mubarak. Much as they trip over themselves to appropriate societal energies, I have a hard time believing Mubarak’s people foresaw any of this. One of the most fascinating lessons to be distilled from the whole elections exercise is the contest between real and fake judicial structures in Egypt. This subterranean struggle has been ongoing for two decades, of concern only to judges and lawyers anxious to uphold professional standards and self-governance. Completely unbeknownst to Mubarak and his henchmen, the elections have exponentially increased the audience interested in this previously obscure affair, exposing the regime’s tactics of infiltration, co-optation, and corruption of the judicial community. Nowhere is this more evident than in the delicious comeuppance of the Presidential Elections Commission (PEC). The PEC is of course the regime’s signature showpiece in the election ruse, set up by Presidential Elections Law 174/2005. Designed to mimic the cachet of the venerable Election Commission of India but with none of the content, the PEC was soon exposed for the fraud that it is. Everyone castigated its “mythical” and “dictatorial” powers and took to task its bumbling chairman, Supreme Constitutional Court chief Mamdouh Mare’i, who’s always been held in maximum contempt by the very legal community to which he nominally belongs. Law 174/2005 is blatantly unconstitutional, exempting the PEC’s actions from any appeal before any body, violating Article 68 of the constitution and absurdly setting the PEC’s writs above even the president’s, whose decrees aren’t immune from judicial oversight. In an evidently fanciful move, human rights groups decided to challenge the PEC’s immunity. They contested its decision to exclude them from monitoring polling stations before the first-instance Court of the Administrative Judiciary (Mahkamat al-Qada’ al-Idari). On September 3, the court handed down a package of election-related rulings whose significance shouldn’t be forgotten as we enter the parliamentary elections hoopla. First, the court ruled that the PEC has no jurisdiction over the issue of NGO monitoring, and that civil society groups should certainly be allowed to enter polling stations and observe voting procedures. Second, the court contradicted the PEC’s judgment and surmised that presidential candidate Wahid al-Uxori (head of one of the cardboard opposition parties) cannot enter the race due to the disputed status of his party leadership. Third, the court referred the suit by Kifaya to the State Commissioner’s Authority (SCA), an important court advisory body that prepares legal opinions which are then often adopted by the court. Recall that Kifaya contested the Interior Minister’s decree announcing the results of the May 25 referendum on the amendment of Article 76 of the constitution, buttressed by the Judges’ Club report indicating that average turnout did not exceed 3-5%. The referral to the SCA means that the court sees merit in Kifaya’s suit and doesn’t deem it frivolous. Fourth and in many ways most remarkably, the court agreed to refer specific articles of Law 174/2005 to the SCC, arguing that the fact the law was vetted by the SCC before passage by parliament (already an irregular and unprecedented occurrence) does not rule out further judicial review. The rulings are not only significant for bolstering activists’ demands. Taken together, they completely shatter the PEC’s immunity, question its judgment, and by referring Law 174 to the SCC again, implicitly challenge Mamdouh Mare’i’s competence as both SCC chief and PEC chairman! Experts pored over the legal morass, pitting a pillar of Egypt’s judicial structure (administrative courts) against a newfangled institution of dubious constitutionality (the PEC) headed by a presumptive legal maven who in reality is a loyal regime apparatchik. The regime moved to quickly contain the looming crisis. Under pressure from his bosses, Mare’i quickly retracted his disastrous statement and dispatched government lawyers to appeal the court’s rulings, thus effectively admitting the PEC’s status as nothing but an administrative organ. On September 6, the Supreme Administrative Court (SAC) issued a ruling that was widely interpreted as a hasty political compromise intended to salvage the elections scheme from grave constitutional crisis. The ruling was a perfect instance of doublespeak, a delicate dance around the luculent unconstitutionality of the PEC. On one hand it upheld the PEC’s immunity from judicial review. On the other, it urged reconsideration of the provisions of Article 76 exempting the PEC from judicial oversight! The SAC’s deliberations stretched into the evening and were led by the head of Magles al-Dawla, Justice Abdel Rahman Azouz. Moreover, the ruling went against the report of the State Commissioner’s Authority, a rare occurrence. It’s certainly not the first time the government prevailed upon the SAC to override a perturbing ruling of a lower court; the administrative court’s history is replete with additional examples. Suffice it to note that the SAC was established in 1955 for precisely this function, to contain and control the spate of rulings against the government by independent-minded courts of first instance. I’ve already discussed who Mare’i is and his underwhelming judicial credentials. His mettle as a judge has been irrevocably dented over the past month, and one can only wonder what that will mean for the status and reputation of the Supreme Constitutional Court once Mare’i returns to it after this annus horribilis, especially since the SCC has already weathered significant infiltration after its July 2000 ruling on judicial supervision of elections. At this juncture, I can’t resist honouring a judge cut from an altogether different cloth. 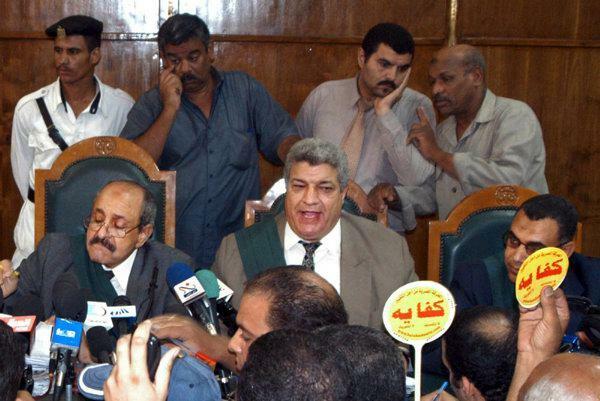 Farouq Ali Abdel Qader is easily the most prominent and well-known judge in Magles al-Dawla today (seated moustachioed judge, above). He handed down the rulings of September 3, followed by another ruling just days later striking down the PEC’s decision to exclude hundreds of judges from supervising elections. Abdel Qader graduated first of his law school class in 1959 and has since crafted an upstanding, illustrious judicial career. Young judges speak of him reverently as “Farouq bey,” compiling and circulating his copious rulings on compact disc to pore over the important legal principles he sets down. You wouldn’t know it from his unassuming and genuinely modest bearing, but Abdel Qader has one of the most truly indispensable and difficult jobs in Egypt today. As President of the Courts of the Administrative Judiciary (34 circuits), Abdel Qader literally sits at the interface between citizens and state. Administrative courts are the arenas where citizens contest any and all acts of the administration. As head of the crucial first circuit (da’irat al-afrad), Abdel Qader determines the fate of citizen petitions against the government. As he sees it, he is constantly mediating between citizen freedoms and state power. From that vantage, he’s handed down some remarkable rulings in defence of citizen rights. Just a handful of examples: the ruling authorising marches and demonstrations to protest the American war on Iraq; the ruling allowing the newspaper al-Shaab to resume publication; the ruling that deemed unconstitutional the controversial tagging of garbage collection fees onto electricity bills, and the ruling ordering that Tareq al-Zomor be released from prison. al-Zomor has served his 22 year sentence in connection with his role in the Sadat assassination. Unlike most administrative court verdicts, this last was not reported in the state-owned press. Whether these rulings were implemented or not is another matter entirely (the last certainly wasn’t), and whether one agrees or not with Abdel Qader’s verdicts is immaterial. The point is that for decades now, he has been a quiet, diligent, and upstanding defender of an inadequate but still decent constitution. I can scarcely imagine what it is like to be deluged with the thousands of petitions that he contends with, at a time when acts of the government grow more arbitrary and legislation more repressive and unjust. His sense of responsibility must be crushing, for every administrative court judge is keenly aware of how his verdicts shape future cases. So when Abdel Qader rules in favour of civil society groups monitoring elections, or in favour of reopening opposition newspapers, or in favour of peaceful demonstrations, he is aware that he is sending potent signals and setting subtle precedents that get at the core of the regime’s legitimacy and power. I know I am not the only one who scoffed when I read al-Gomhuriyya editor-in-chief’s veiled attack against Abdel Qader on September 5. Or when I learned that Mamdouh Mare’i had decided to ignore Abdel Qader’s verdicts. There are judges and then there are judges. Maximum respect and admiration are owed to Abdel Qader and his colleagues. As the regime sells Mubarak as “the first elected president,” let’s pay attention to the details of the voting process and its rampant abuses, amply documented here by the intricate network of citizen groups, with more sure to surface in the coming days. Let’s remember those righteous judges who refused to let the NDP’s voters enter polling stations en masse, earning an angry rebuke from Gamal Mubarak’s errand boy Mohamed Kamal. In a pre-emptive bid to blame the pathetic turnout on judges, Kamal complained on al-Jazeera of judges’ “rigidity” which turned voters away, he suggested. Gamal Mubarak pal Ahmed Ezz was reportedly also furious with stringent judges on election day, instructing NDP proxies to file police reports on those judges who refused to allow more than one person at a time into polling stations. And let’s await the post-mortems of judges themselves, which will determine their stance on the upcoming November parliamentary elections. The Judges Club will begin hearing sessions on Monday to collate judges' experiences supervising the poll and prepare its report. 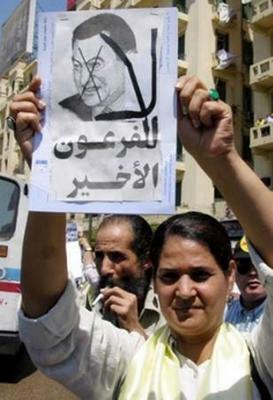 The presidential elections ploy is over, Mubarak is still president, the regime’s stability is untouched. But I’m not concerned here with regime stability. I’ll leave that sordid topic to those who call themselves “risk analysts,” to foreign embassy types, and to those quaking at the very mention of the word change. A step to democracy hasn’t been taken, because democracy doesn’t proceed in neat little graduated steps that we can tick off and list. What strikes me is how government ploys have this pesky habit of going awry, thanks to the actions of citizens and judges with other ideas. For the pessimism of their intellect and the optimism of their will, I bow to them in awe and respect. *Courtroom photo from al-Ahram Weekly.